Neily: Dumped by Carly for a notorious bad boy, Neily didn t answer the phone call she made before she died. If he had, maybe he could have helped her. Now he can t get the image of her lifeless body out of his mind. Audrey: She's the reason Carly got tangled up with Brighton's fast crowd in the first place, and now she regrets it especially since she's convinced the police have put the wrong person in jail. Audrey thinks the murderer is someone at Brighton, and she wants Neily to help her find out who it is. As reluctant allies Neily and Audrey dig into their shared past with Carly, her involvement with Brighton's dark goings-on comes to light. But figuring out how Carly and her killer fit into the twisted drama will force Audrey and Neily to face hard truths about themselves and the girl they couldn t save. 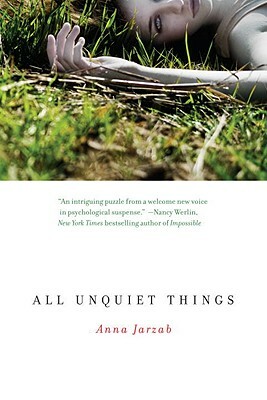 Anna Jarzab grew up entirely in the suburbs, first outside Chicago and then in San Francisco s East Bay area, where "All Unquiet Things "is set. She currently lives in New York City. This is her first novel. Visit her online at www.annajarzab.com. "From the Hardcover edition."" "It’s a slow-building, slow-burning mystery—Jarzab is as interested in probing Neily and Audrey’s emotional states and the ramifications of Carly’s murder as she is in solving it—but the author’s confident, literary prose makes for a tense and immersive thriller."